I won’t claim to take as much time with presentation as Lisa does, but Eli is either paying more attention than I thought to my small efforts or he is simply reading this blog. The recipe he invented yesterday (with production assistance from Tony) shows he’s as careful with style as substance. The plan was for our regular rice with tofu and vegetables. I don’t make dinner often under even the best of circumstances; now, after a week locked into a bad head cold, I was just on the sidelines, listening, as Eli chatted about developing a new recipe for the broccoli. His first idea was to serve the cooked spears dipped in beaten egg. Tony balked. Eli cried. 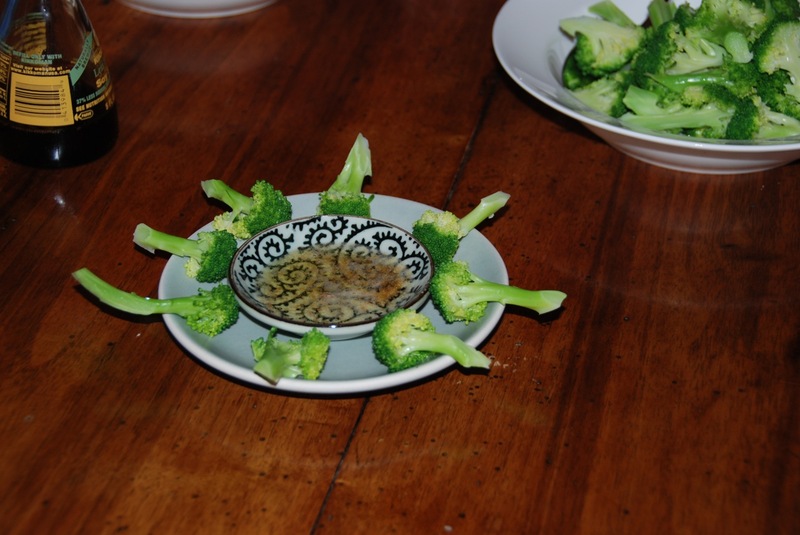 I thought about various other nice things into which one can dip one’s vegetables. There was a long conversation on the couch during which Tony successfully distracted Eli from his recipe long enough to return to cooking. We thought the recipe was forgotten, but I should have known my tenacious child would find a way to make his recipe work. Dinner approached, and then Eli said, “I have another idea for my recipe!” I held my breath. But in the end, it was OK. Prepare one head of broccoli by separating the spears and steaming lightly. While it’s cooking, melt a couple tablespoons of butter and let cook until it browns very slightly. Add a sprinkle of brown sugar. 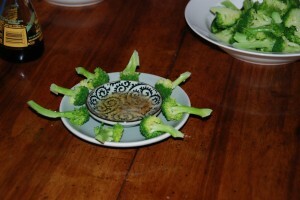 Serve in a shallow bowl with the broccoli spears surrounding it. Now our proud boy wants to write a cookbook; I think we will.